The Sol 45 is Lensbaby's latest optic, and it promises to be the brand's most most playful and accessible lens yet. 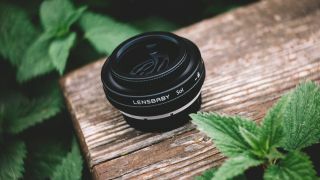 While Lensbaby has branched out a little in recent years, producing more substantial lenses and moving away from the 'wacky' and affordable tilting lenses that established the company more than a decade ago, the Sol 45 sees the brand go back to basics. According to Lensbaby, the Sol 45 "responds to those curious and insightful individuals who desire intention, imagination, and passion within each experience they live". With a fixed aperture of f/3.5 and manual focus only, the Sol 45 is designed to be tilted so as to create a circular area of focus, with the remainder of the image rendered in "bold blur and smooth bokeh". As well as this, the Sol 45 features what Lensbaby calls 'bokeh blades'. Situated on hinged arms hiding at the edge of the lens, these can be moved into the lens’s field of view, with Lensbaby claiming they add subtle lines of texture to the bokeh, creating stylized effects that photographers could otherwise only add in post-production. According to Lensbaby Co-Founder and CCO Craig Strong, the Sol 45 "opens up a new creative experience for those who want to dip their toes in the Lensbaby pool. The Sol 45 inspires visual artists to find new and fun ways to see their world by creating unique images in camera – no filters needed". The Sol 45 will be available in Canon EF, Nikon F, Sony A, Sony E, Pentax K and Fujifilm X lens mounts, while there will also be a 22mm version specifically for Micro Four Thirds shooters called the Sol 22 (44mm equivalent). The new Sol 45 will be priced at $199.95 and is available now. Pricing and availability for the UK and Australia are to be confirmed.